Gas separator is required if the percentage of free gas percentage at the pump intake is greater than 10% with radial flow pump stages. In case of mixed flow pump stages, gas separator is required if the free gas is greater than 15%. Refer to the articles “ESP: Pump impeller types” and “ESP: Pump Stage” to review the difference between radial flow and mixed flow stages. NB: The article “ESP: Intake & Gas Separator” describes both types of gas separators (reverse flow and dynamic gas separators) as well as theirs advantages and limitations. If the free gas percentage at the pump intake is from 30% to 60% by volume, a gas handling device is generally considered. Refer to the article “ESP: Gas handling device” to review how gas handling device works. Refer to the manufacturer’s catalog to select the proper seal section. Make sure that the seal series in the same as that of the motor and pump series, otherwise a series adaptor is required to connect the units together. The HP required for the seal depends on the TDH produced by the pump and has to be added to the HP required for the pump. NB: Labyrinth seal chambers are not generally recommended at deviations greater than 30° from vertical. In the other hand, the bag-style seal chamber is recommended for deviated-well applications. Refer to the article “Motor Protectors” to review the different types of seal as well as theirs advantages and limitations. When selecting a motor, consideration should be given to choose as large motor as possible for the casing to optimize the initial cost, motor efficiency, operating cost and ensure better motor cooling. NB: More attention should be paid when selecting downhole equipment lengths and diameters for deviated wells especially in case of high dogleg severity. To select the proper motor size for a predetermined pump size, you must first determine the Brake Horse Power (BHP) required by the pump. 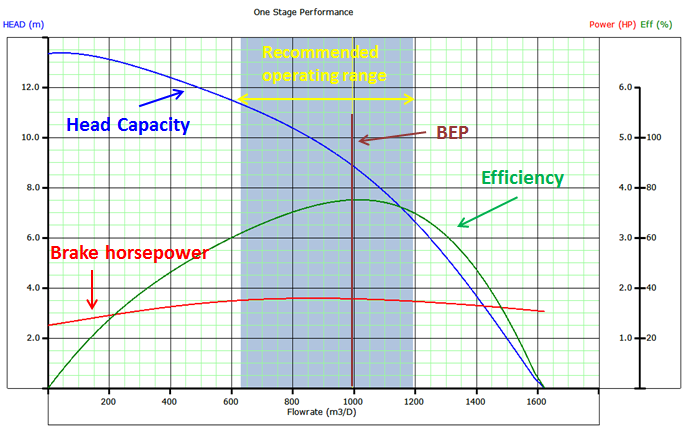 The BHP per stage represents the power required by a single stage of the pump to produce the anticipated capacity. The BHP per stage is obtained by referring to the published pump performance curve for the selected pump and reading the value on the BHP axis of the right scale. BHP = Total Stages x BHP/stage x SG. Typically, the motor is selected to operate in the range from 70 to 100% of its rating. Generally speaking the maximum motor load should not exceed 110%, in the other hand selecting a motor with minimum operating load (e.g. 10% or 20%) nullifies the protection monitoring of the motor. The high voltage / low current motors have lower cable losses, therefore require smaller size of cable conductor (consequently, lower initial cable cost). In the other hand, high voltage motors have superior starting characteristic; a feature that can be extremely important if excessive voltage losses are expected during starting. Although, the higher the motor voltage the more expensive is the motor. NB: The horse-power required by the seal and the gas separator/gas handling device (if any) has to be added to the BHP required to drive the pump. The HP required for the seal, gas separator and gas handling device are obtained by referring to the manufacturer’s catalog. NB: All operating parameters have to be within their recommended ranges (e.g. thrust bearing load, shafts load, housing burst pressure, and fluid velocity past the motor). A particular attention should be paid when selecting equipment metallurgy if corrosive and/or erosive downhole environment is expected.